Lafarge Malaysia Berhad is a leader in the Malaysian construction industry, contributing towards Building Better Cities. Our offerings and solutions provide cities and townships with more housing, making them more compact, more durable, more beautiful and better connected. Headquartered in the Klang Valley, we offer the most comprehensive network of facilities, and the widest solutions to better serve customers. We have three integrated cement plants, two grinding stations, more than 40 concrete batching plants and six aggregate quarries across Peninsula Malaysia, and we employ close to 2,000 people. 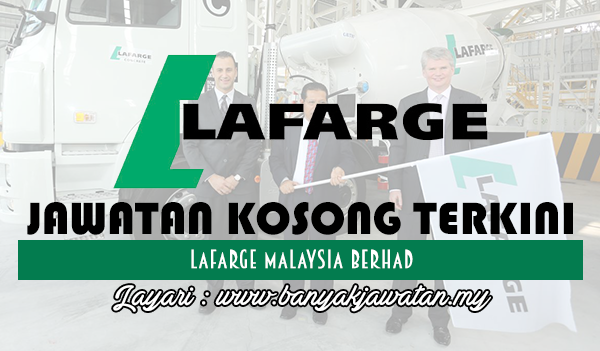 0 Response to "Jawatan Kosong di Lafarge Malaysia Berhad - 5 January 2018"